Malampuzha is a small town located in the foothills of the Western Ghats and derives it’s name from the Malapuzha River. Situated at a distance of 8 kilometres from Palakkad, Malapuzha is a lush green tourist spot that comprises of the Malapuzha Dam, the reservoir and it’s catchment area. The place is very much scenic with the Western Ghats forming the backdrop to the dam and the Malampuzha garden on the other side. The main attractions are the Malampuzha Ropeway, Fresh Water Aquarium, Snake Park, Rock Garden and the Horticlture Development Farm.The dams and gardens are illuminated on Saturdays, Sundays and National Holidays from 19.00 – 20.00 hrs. Other places of tourist importance aound Malampuzha include Kanjirapuzha Dam, Siruvani Dam, Fantasy Park, Meenvallam and Attila Waterfalls, Nelliampathy, Silent Valley National Park and Palakkad Fort. The best time to visit this place would be from September to February. Malampuzha is easily accessible via road from Palakkad. There are frequent buses to Malampuzha and it is just 20 minutes drive from Palakkad. I drove all the way up from Cherpulassery to Malampuzha. The main activities you can indulge in are adventure ride on the ropeway, photography, bird watching, stroll through the garden, explore the dam, trekking,boating, and drop in by the fresh water aquarium, snake park and the rock gardens. With christmas just a few days ahead, and a Munnar trip on the cards, we were almost sitting bored at Cherpulassery with nothing much to do. That is when we thought of driving to Malampuzha to explore the place as well as experience the ride in the famous ropway. We lazily got ready and started our journey to Malampuzha. We choose to drive via Ottapalam and in another one and a half hour we reached Palakkad. The road, I bet would be one of the best in Kerala. We reached Malampuzha dam by 11.30AM, and the first thing that we did was to have a bit of adventure on the Malampuzha Rope Way. We parked our car at the parking slot near to the rope way and headed towards the ticket counter to buy the tickets. It costed us Rs40/person, for the tickets. There wasn’t much rush and we comfortably got ourselves a carrier on the ropeway. It took off quite smoothly from one side of the dam to the other, slowly cruising at a height of 60 feet. The total ride is over a distance of 1252 meters (to and fro) and on the way we got a bird’s eye view of the Malampuzha gardens, the Malampuzha Dam, the hanging bridges and the people enjoying the boat ride in the canal below. After 20 minutes of ride we got down at the same point from where we boarded the carrier. The ride was slightly adventurous but there was nothing to fear about. Malampuzha rope way is the only Passenger Ropeway in South India and is the best possible way to experience the garden and the places around. Children would surely enjoy the ride. As far as safety is considered, they have implemented all possible measures to contain any possible emergencies, which includes well trained staffs, a DC Generator and a rescue engine that swings into action in case of power failure or an emergency. From there we took a left and drove towards the catchment area of the dam. 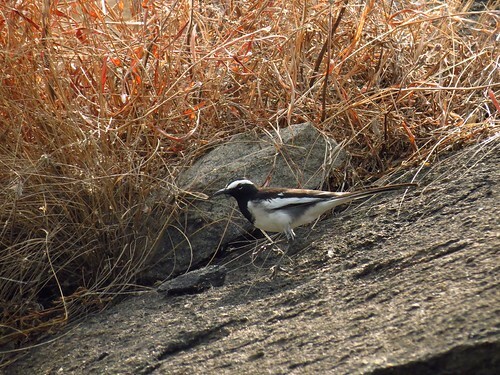 We spotted some birds in their natural habitat and I managed to capture the photos of Magpie Lark and the White Stork. After driving for three to four kilometers, the road started deteriorating and we decided to stop and return to the main gate. On the way back we took a deviation across a narrow bridge to the Malampuzha PWD Guest House. We could see the dam, the reservoir and the gardens from there. Next we headed straight to the main gate. Having seen the Malampuzha garden and the hanging bridge from the rope way, we did not visit the garden again. Moreover the garden seemed to have lost it’s past glory. Next we headed straight to the Snake Rehabilitation Center. Watching the snakes (different types, sizes and colors) crawling around in a zig zag manner, was fun. The last place of visit, and infact the best in line was the Rock Garden. Termed as “Modern art at its best” , the rock garden is the first of it’s kind in South India and the second one in India. This impressive collection of artwork was conceived and designed by renowned sculptor and Padma Shree laureate Neck Chand Saini. Made from different varieties of rocks, waste pieces of tiles, granites, stones, electricity fuse carriers, power insulators, broken bangles, dishware, crockery, shells and other objects, these beautiful sculptures, paintings and statues were a treat to the eyes. Considering all the places that I had visited in Malampuzha the Rock Garden truly stands out. It is a must visit place in Malampuzha. Contradictory to the title of the article ”Malampuzha – The Vrindavan of Kerala , Malampuzha is far from being one. The gardens have lost it’s past glory and badly needs a face lift. The ropeway and the rock garden are definite crowd pullers and stands as landmarks, next to the Malampuzha dam. I would suggest this place for anyone traversing Palakkad or Malampuzha and has a few hours of time to spend. This is a great picnic spot for children and has the right blend of fun and adventure for them. Alappuzha, known as the “Venice of the East” is an important tourist destination in South India. This town, blessed with picturesque canals, beaches, and lagoons is famous for its backwaters and houseboat cruises. Alappuzha offers boat cruises to Cochin,Kollam and Kumarakom with never-ending view of the lake, lush green paddy fields, spiking coconut trees, calm village life and long canals. Kuttanad – The Rice Bowl of Kerala, which is one of the few places in the world where farming is done below sea level. 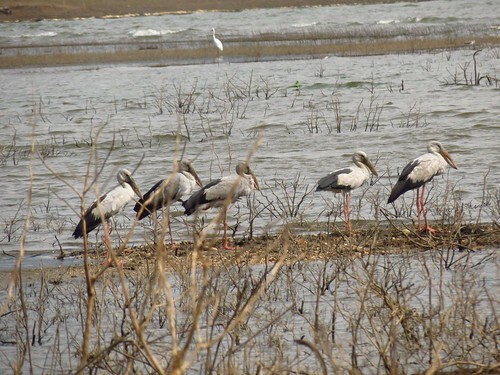 Pathiramanal Island – An island on the backwaters which is home for rare migratory birds from different parts of the world. Alappuzha is easily accessible from any part of Kerala. Regular bus services are available from Trivandrum, Cochin, Kollam and Kottayam (you would get it from any part of Kerala). KSRTC operates boat services from Kollam, Cochin and Kumarakom. All trains stop by Alappuzha station and it is an importnat railhead of the Southern Railway. The nearest airports are located in Kochi and Trivandrum. We started off the journey from Trivandrum by 6:00am and reached Alappuzha boat jetty by 8:30 am. The drive through the national highway was a breeze and we took the right to the boat jetty as we entered Alappuzha town. Flocks of house boats were seen anchored by the river side waiting for takers. We opted for a 2 bedroom a/c houseboat. The total cost for our twelve member team came to INR13000 inclusive of lunch and evening tea. There is ample scope for negotiation and make sure you double check the usage of a/c (in case you have opted for an a/c room) before you leave for the cruise. We had a bad time arguing with the driver as he said that a/c was not included in the package. We had to call back to their office from the middle of the lake to have it sorted out. That was a mood spoiler. As the boat started moving away from boat jetty we could see at a distance the lush greenery and the beauty of the place.On either sides of the lake we saw green paddy fields and cocunut trees towering up the sky. What captured my interest next was the calm and quite village life, the people and their dependence on water for their day to day lives. Very often we see people crossing the river on small ferries and boats or transporting good and commodities. It is totally different from the city lives that we know of. The panoramic view of the lake from the deck of the boat was mind blowing. There are lots of toddy shops by the banks and we dropped by a toddy shop “Nammude Kallu Shap…. :)” to get some fried fish, prawns and duck. Even the thought of these delights as I key this down, is mouth watering!!!!. Well do you think I would have left alone the toddy bottles, got 5 of them…..:). We continued our onward journey to Vembanadu Lake and to my disbelief saw the entire fleet of house boats out there on similar cruises. I need to say that it was over crowded. Next we stopped by a fish stall to get some good fish and handed it over to the cook on board to have it prepared for lunch. As time neared noon it grew hot outside and we moved in and took cover in the a/c rooms. The lunch was ready by 1.00pm and was served on the deck. It was really tasty. We again stopped by the next shop at R BLOCK to get more preparations from the toddy shop. This time we got some cooked squids and crabs. We took at a U turn at R BLOCK and headed back to the starting point. We reached back to the staring point by 4.00pm and then headed back home. We reached Trivandrum by 8:00pm. Houseboat cruise is definitely an awesome experience and is worth the money spent. But there are cheaper options like ferries and service boats which provide the same experience without eating up your money. I am looking forward to give it a try.It is not just a boat ride, there are lots of de-routes that needs to be explored, beautiful places to be seen, some amazing pictures to be taken and some take ways from the lively village life . Yet another Day out!!! This time we choose Surya Samudra as the venue to party.Surya Samudra, situated in Kovalam is one of Kerala’s finest beach resorts. It is located on a cliff overlooking the beach and boasts as being the best romantic getaway in Trivandrum with traditional style Kerala cottages, landscaped gardens and pathways interconnecting them. The view from here is enchanting. Kovalam, Vizhinjam, Azhimala and Poovar are some of the main attractions around. You can go about seeing the Lighthouse, Lighthouse beach, Hawa beach, Vizhinjam Marine Aquarium, Halcyon castle, Vizhinjam harbour and Vellayani lake. This place is also home for many private resorts and hotels. Surya Samudra is situated around 18km from Trivandrum and sandwiched between Kovalam and Poovar. We took the Trivandrum bypass road and as we approached Kovalam deviated to Vizhinjam Poovar Road . It is just 6kms from Kovalam. The main activities you can indulge in are swimming, fishing,sunbathing, yoga, spa and romantic strolls through the private beach and the landscaped property. The plan was to start off from my place by around 2pm and reach Surya Samudra in an hours time. As per the plan we reached Surya Samudra by 3pm. Finding the way to the resort was not that hard. We were greeted by the staff who offered us welcome drinks. We were shown the way to the rooms that were allotted as part of our booking. The rooms were truly beautiful and well maintained. The most interesting thing I found in the rooms were the gorgeous outdoor bathrooms. After settling down, the staff took us around showing the property. The once rocky terrain was beautifully landscaped into one of the most beautiful places that I have ever seen. As this was a day out we were in no mood to be in the room but wanted to indulge in some activities. We headed for the pool to play a game of water polo. The pool was situated on the cliff overlooking the sea and stretching out into the sea (it looked so ) . The place was awesomely beautiful and serene. We had a good game out there, except for the frequent whistles from the guards, asking us to keep our noise levels down.From there we headed right to the private beach. While some of us went straight to the sea, many choose for a game of beach volleyball. Towards 6pm and after the sun set, the sea was getting rough and we went back to our rooms to get ready for the dance floor . They had arranged a DJ for the evening and the dance floor was by the bar named “Madira”. We tuned it to the beat of the music and in a short time the whole crowd was there exulting themselves. It was a great experience dancing and partying by the cliff, with the sound of waves and the music from the speakers. By 8pm the dinner was served. Buffet serving Arabian delights at their “Ootupura restaurant”. I really din’t like the main course as it was not spicy and was more towards being sour, but the desserts saved the day. It you have time and money in your hands, Surya Samurda is a perfect place for a vacation by the seaside, honeymoon trip or even a day out. One Day Fun Day at Taj Varkala!!! Yet another outing that sprouted out of a flyer ” One Day Fun Day at Taj Varkala ” . Me and my colleagues decided to spend a day at Taj Varkala availing a corporate offer, to experience the property and chill off the hectic week behind exploring the whole of Varkala. Taj Varkala also known by the the name ” The Gateway Hotel Janarthanapuram” is located atop a majestic red cliff in Varkala overlooking the Arabian Sea. This charming resort is operated by the Taj Group of hotels and offers good service, unforgettable experience and a good view of the Arabian sea. It is located in between the Papanasam beach and the Varkala cliff. Talking about Varkala, it is a coastal town situated 51kms north-west from Trivandrum. It is famous for its beaches, cliffs, resorts, temples and Mutt. Located in the outskirts of Trivandrum and facing the Arabian sea, this place tops the charts of the most favoured tourist destinations in Kerala. The main attractions of this place are Papanasam Beach,Varkala Beach, Varkala Cliff and Helipad,Kappil Beach, 2000 years old Janardana Swami Temple and Sivagiri Mutt. Varkala is easily accessible and well connected via road and rail. There are frequent buses plying to and from Trivandrum to Varkala. KSRTC operates volvo buses too. You can also reach Varkala by rail and the railway station is just 4kms from the beach. The nearest airport is in Trivandrum. The main activities you can indulge in are swimming,cycling, beach games, fishing,sunbathing, yoga, boating and romantic strolls through the beach . The plan was to start off from Trivandrum early in the morning and reach Varkala by 6am,visit the Papanasam beach, Varkala cliff and Kappil beach, spend the day there in Taj Varkala, visit the varkala beach in the evening and return back to Trivandrum by 8pm. As per the plan I along with my wife started off from Trivandrum by 6am on mour car,drove via NH47 till Kallambalam and from there took the left to Varkala via the Varakal-Kallambalam road and finally deviated to the Varkala-Thazhevettoor road to reach the beach. We reached Varkala by 6:45am. After parking the car in front of the Janardana Swami Temple, we walked down towards Papanasam beach. Except for some hindu priests and people who had come to perform “bali” (sacrificial ritual performed in memory of the departed souls of ancestors) the beach was almost empty. We sat there enoying the cool breeze and the calmness to the sea. At a distance we could see fishing boats (catamarans), probably wading their way back after the early catch. After spending half an hour at the beach, we drove towards the Varkala Cliff . On the way to the cliff e saw the entrance of Taj Varkala. We reached Varkal Cliff in less than 15 minutes. The view from the cliff was awesome, a panoramic view of the sea, beach and the cliff extending sideways. You can walk down the cliff towards the beach. We choose to walk sideways, through the narrow pathway overlooking the sea. There are restraurants and hotels on the right and to towards the left, down below the cliff, is the roaring sea. We could see yoga classes being conducted on the beach as well as tourists sunbathing out there. That was a perfect frame to capture. Varkala is beautiful place to spend a day or an evening. If you have the budget and are looking for an ambient place to enjoy or chill off Taj Varkala is recommended. You could check with them or browse the site for any offers. There are a plethora of budget hotels and restaurants which are equally good, and can save you quite a lot of money. I frequently drive to the cliff, sometimes in the evenings and sometimes late night. Its a awesome place to unwind.